In a game of many ups and downs, ‘Ensians looked comfortable enough at the final whistle, when sustained pressure could easily have produced further points. As it was, both sides scored three tries, the difference in the score line being the faultless conversion rate of the ‘Ensians’ Connor Bateman. The home team kicked off, gave away an early penalty and Northallerton found a good touch in the opposition 22. The visitors’ pack was a sizeable unit and from the lineout drove ‘Ensians back to their goal line with some ease. “Pick and go” phases followed and quickly resulted in the first try after only 5 minutes. Things looked ominous for the lighter, smaller ‘Ensian forwards. However, Rob Lofthouse, skipper in the absence of injured Sam Featherstone, did some good spoiling work on the restart and then chipped ahead to pin the visitors back to their 22. ‘Ensians had possession now and good passing in the threes suddenly put Luke Freer into space for a strong run to the posts. The try was improved by Bateman and the home team had the lead on the quarter hour mark. Northallerton kicked directly into touch, ‘Ensians had the put-in at the line-out option on half way and were in control, having the better of the forward exchanges despite earlier indications of problems. A succession of penalties made matters difficult for the visitors and they were unable to break out of their own half. The ‘Ensian threequarters were also looking confident and handling at pace saw left wing Nick Keinhorst in the clear, only to be called back for a forward pass. After 20 minutes, the visitors were up against it and kicking straight to touch from outside the 22 did nothing to help them find the “right areas”. Another good passing movement from the home side led to a kick ahead going dead, but this turned out to be a “free ball” due to an earlier penalty award. 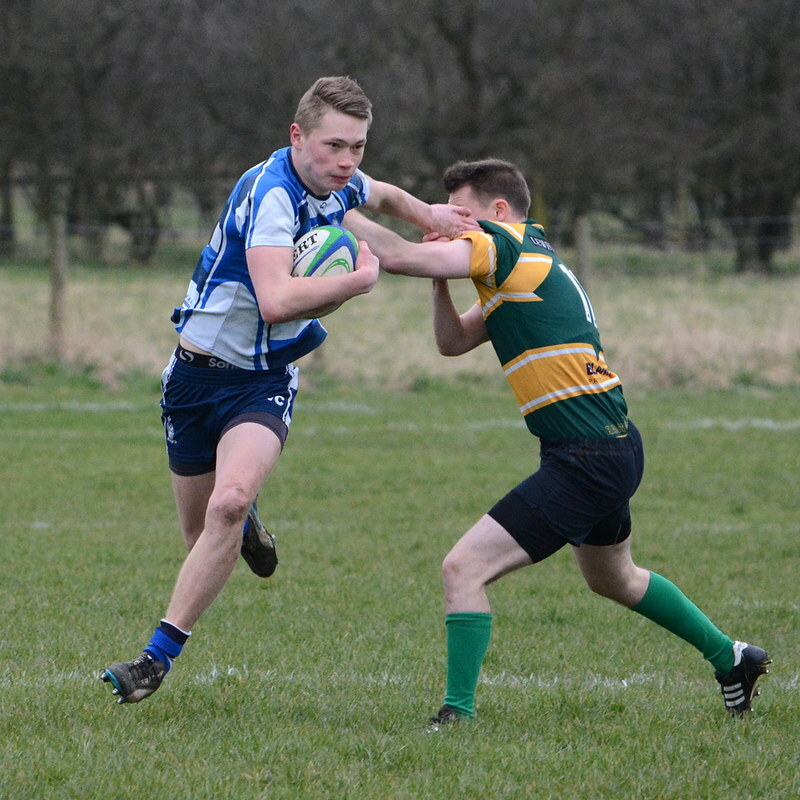 ‘Ensians kept up the pressure with turnover ball and penalties, but a Northallerton interception opened them up and attack turned into determined defence. They were soon back in opposition territory and a lovely outside break by Ollie Eaves led to a second try for Freer, once again converted. 14-5 after half an hour, with Northallerton looking the worse for wear, was a strong situation. Northallerton again kicked directly into touch to self- inflict more pressure on themselves and the home side took full advantage to win a penalty and go over in the corner from the quick tap. Lofthouse was the try scorer, Bateman the improver with a superb conversion from the touchline. With the scoreboard moving up in sevens, 21-5 whetted the appetite, but the tables turned and it was the visitors who began to dominate in the period before the break. ‘Ensians defended heroically to keep them out, but the visitors had certainly discovered their momentum and looked a different team. Northallerton, though, fell away after the restart in the face of great ‘Ensians defence and seemed devoid of ideas, their main point of attack coming from the number 8 picking up at the base of the scrum and breaking wide. Little ground was made and the game became scrappy, with neither side making much impression in attack. Northallerton’s big, heavy forwards were dealt with by some strong ‘Ensian tackling, but the anticipated home side dominance was not happening. The visitors reverted to the driving maul tactics and made very good progress, but the game lacked decisiveness and the frequent injury stoppages did nothing to help it to flow. Northallerton had the territory though and another driving maul led to more scrums and stoppages, with solid defence needed to keep them out. Eventually the breach came and a converted try brought the score to 21-12, with plenty of time left for the result to go either way. Northallerton indeed looked interested and were pushing ‘Ensians around a bit, and a third try came following further, almost unhindered, driving mauls. The conversion failed, but 21-17 was still anything but safe with some 10 minutes left. However, Ali Campbell and Paddy Phipps pepped things up with good ball-carrying runs and the tide turned ‘Ensians’ way, even pushing the visiting pack and winning scrum penalties. The match became quite petty and bad tempered towards the end and after a poor period ‘Ensians finished very strongly winning penalty after penalty but failing to cross the line. The game closed on the visitors’ line with no further score. Thank goodness for the Bateman boot!